Thupten Chökyi Dorje (Tib. ཐུབ་བསྟན་ཆོས་ཀྱི་རྡོ་རྗེ་, Wyl. 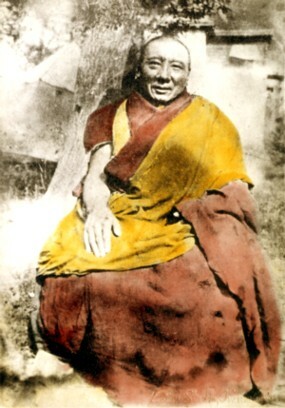 thub bstan chos kyi rdo rje) (1872-1935) — the Fifth Dzogchen Rinpoche. The Fifth Dzogchen Rinpoche was born in Kham Riwoche, the same region as the first incarnation, Dzogchen Pema Rigdzin. He received teachings and empowerments from Jamyang Khyentse Wangpo, Jamgön Kongtrul Lodrö Thaye, Khenpo Pema Vajra, Patrul Rinpoche and many other teachers of the Nyingma and Sarma traditions. Without relying on any training in the traditional sciences such as grammar and logic, he spontaneously acquired expansive realization and is credited with supernatural abilities. It is said that as a result of his exceptional powers of realization, the tormas melted into light and became nectar, he tied the sun in its place, made the empowerment vase float in space, made the saffron water of the vase inexhaustible, left footprints in rocks, and caused water to spring from arid deserts. Once, it is said, after he wiped his bleeding nose with a cloth, the cloth transformed into a thangka full of blessing relics. During his time as abbot, there were more than a thousand monks who resided continuously at Dzogchen Monastery and the number of branch monasteries increased to more than two hundred. With the help of the great Khenpo Shenga, he transformed Shri Singha Shedra into the most prestigious centre of learning in the whole of Kham. He recognized many of the next generation of tulkus, including the Sixth Shechen Rabjam, Fifth Dzogchen Pönlop Rinpoche, Third Dzogchen Gemang Tulku, and Tsö Patrul Rinpoche. His other students include Drodul Gargyi Dorje and his sister Gyarong Khandro. His writings include a famous practice of Gesar. Nyoshul Khenpo, A Marvelous Garland of Rare Gems: Biographies of Masters of Awareness in the Dzogchen Lineage (Junction City: Padma Publications, 2005), pages 428-431. Tulku Thondup, Masters of Meditation and Miracles (Boston & London: Shambhala, 1999), pages 256-257. This page was last edited on 20 June 2018, at 18:35.